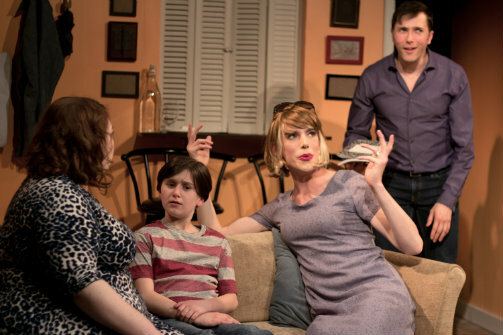 Elizabeth Klein, Austin Levine, Sam Given & Yuval David in Daddy Issues. Photo by Robert Levin. BOTTOM LINE: A zany, screwball comedy about an out-of-work actor’s attempt to please his overbearing parents by hiring a child to pose as his son. Donald Moscowitz (usually played by Yuval David; played by understudy Stephen Millett on opening night) is a gay out-of-work actor whose biggest hope going is landing a cat food commercial. When his overbearing father (Tony Rossi) pressures him to abandon his gay lifestyle, get a real job, marry a woman, and have a child, Donald tries to placate him by telling him that he had a son with an early girlfriend. Dad is overjoyed and a date is set for the entire family to come over and meet the little tyke. Where do you find a kid who can believably play your son on short notice? Luckily little Johnny Walker (played by Austin Levine and Alex Ammerman on a rotating schedule) who lives in the building is mature enough to understand the situation. He is also willing to compromise his ethical code of not lying to make a quick buck—or five hundred. This kid drives a hard bargain. The play is sheer screwball silliness. If you’re someone who likes to think through every detail and evaluate plausibility, you’ll end up spinning your wheels on this one. This is a veritable festival of implausibility. When Donald says his son is ten, his family assumes he means ten months and later ten days old. When the kid’s real mother (Megan MacPhee) comes looking for him, she doesn’t recognize him simply because her glasses are missing. At one point, the kid serves her a drink. No problem. “I can’t see anything without my glasses.” The play takes place in 1982, but I couldn’t think of one good reason why this play needs to be an ’80s period piece. Save for one reference to Joan Rivers as a working comic, it felt 2016 to me. David Goldyn directs this sitcom of a play very capably. He uses an excellent set design by Kevin Klakouski to his advantage, finding a natural place for 6 actors to inhabit the small space comfortably without making the play feel cluttered. But child actor, Austin Levine, steals the show. Levine is a natural con artist, suave and charming, adorable qualities in a ten year-old. It’s satisfying to watch a kid outsmart every adult onstage and serve as the only voice of reason. Note to casting directors: Levine bears a striking resemblance to what Robert DeNiro must have looked like as a child. Biopic, anyone? The show is headlined by Yuval David as Donald, but due to a family emergency, his understudy, Stephen Millett, went on for him on opening night. Kudos to Mr. Millett for his ostensibly well rehearsed and polished performance. There was nothing tentative about him, which is impressive given that he carried a two-hour show before it was officially open. Daddy Issues wants to be nothing but a good time. You will do yourself a favor by turning off your discerning mind before entering. Allow this zany comedy to entertain you with what it has to offer. Daddy Issues is by Marshall Goldberg. Directed by David Goldyn. Set Design is by Kevin Klakouski. Lighting Design is by Terri Tomola. Costume Design is by Cheryl McCarron. Stage Manager is Jennifer-Elizabeth Cooper. The cast is Tony Rossi, Kate Katcher, Deb Armelino, Mary Ellen Ashley, Sam Given, Elizabeth Klein, Alex Ammerman, Austine Levine, and Megan MacPhee.